Sometimes the hardest part of a long project is to keep on track an remain focused. This is especially the case for Perlinoid which has seen many iterations both in terms of mechanics and aesthetics. At the beginning of November it became apparent to me that I needed a set of reference drawings that I could always access without a second screen or the need to switch applications. Hence, I decided that I would create a map (or atlas) to help me keep the visuals consistent. The map consists of six settings (desert, forest, swamp, mold, city, machine) and for each of those I tried to find background patterns as well as items of various sizes that I can use to assemble the final background paintings. 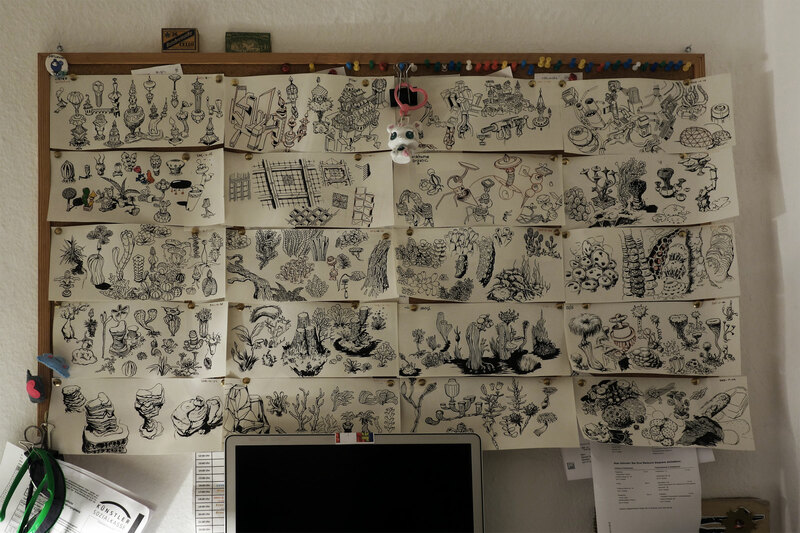 As you can see in the photo, I ended up with a pinboard full of drawings. Out of these I’ve chosen three of my favorites that you take a closer look at.